The true aim of life is to find the Divine's Presence deep within oneself and to surrender to it so that it takes the lead of the life, all the feelings and all the actions of the body. This gives a true and luminous aim to existence. Exists only by and for the Divine. 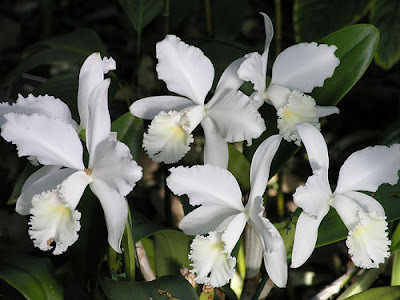 Large fragrant white flower with three narrow petal-like sepals held behind two wide horizontal trilled petals and a third lower petal modified to form a showy lip; borne in few-flowered racemes. An epiphyte with thick stiff leaves and pseudo-bulbs.